The classic Yume Nikki, which released in the summer of 2004 for free, is what Yume Nikki: Dream Diary (Dream Diary) reimagines. The original had you explore large, terrifying worlds inside the dreamscape of a deranged girl, which was as mysterious as it was unsettling. According to the publisher AGM PLAYISM, Dream Diary is not a remake, but instead “a collaborative show of the utmost respect for auteur Kikiyama’s seminal release”. The balance it tries to strike is delicate, as it ambitiously tries to pay homage to the original, while bringing the series into 3D and incorporating other modern elements. One of the most notable characteristics that were established in the original Yume Nikki was that Madotsuki, the player character, was a total shut-in. She would not — could not — leave the house by any means outside of a dream. But at the beginning of Dream Diary, she’s standing outside a convenience store, under the setting sun, in the fresh air in front of a frozen coke paradise. Granted, the first section is a dream, but it still marks the beginning of a long line of breaks from the original vision of Yume Nikki that disappointed me, and will probably disappoint other fans of the original. 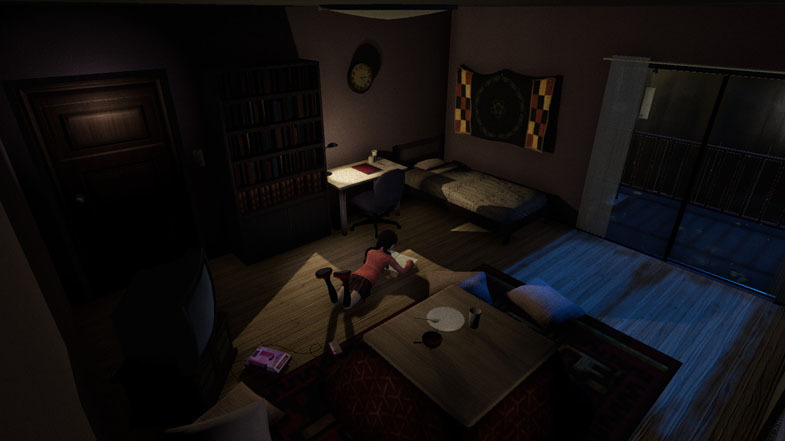 Fans of the original Yume Nikki will also be interested in seeing Madotsuki’s room, which is one of the more faithful 3D recreations in the game. A majority of the recreated areas look faithful to their 2D counterparts. The hub world has been cut to a total of six doors, though, which is half the original selection of Yume Nikki. Places like the mall have eerie lighting effects that really helps set the mood and immerse the player with a sense of loneliness. The school, which is a new location, has a crisp, sunset palette that’s pleasing to the eye and feels oddly comfortable until you enter its dark, narrow corridors, where it becomes a little creepy and unsettling. Other locations, like a dark street filled with sentient eyeballs, evokes that sense of horror right away. Each location has a different and distinct feel to it, ranging from horror to wonder, recreating those feelings found in the original Yume Nikki. 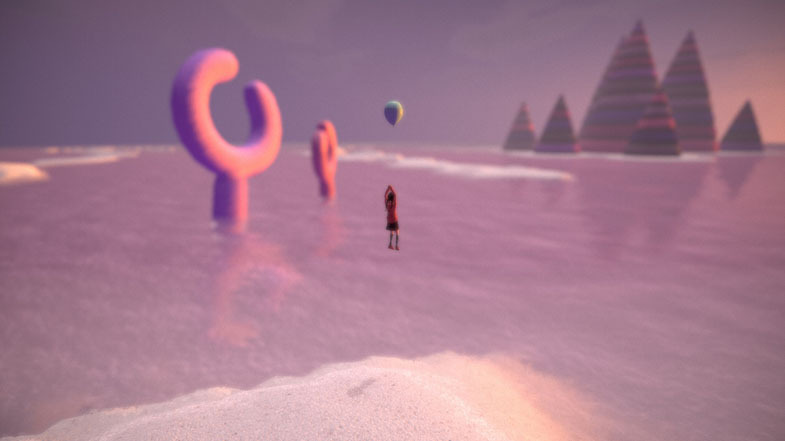 Dream Diary has two different ways for Madotsuki to explore its worlds, depending on which section you are exploring. The first is a Prince of Persia style 2.5D platformer, where Madotsuki will pull herself up onto higher ledges and has to use the world around her to avoid enemies like Mannequins and Toriningen while jumping over gaps and sneaking past enemies to survive. Pulling yourself up onto a ledge takes what feels like forever and doesn’t always work unless you’re precisely underneath the ledge. Sneaking past enemies feels like it’s random luck if you’ll be discovered or not. The other type of angle is an overhead one more reminiscent of the original Yume Nikki. NPCs living inside these worlds look good in 3D, and given the surreal design they’re based on, it’s impressive to see them naturally translated into the third dimension. Madotsuki rocks the extra dimension too. It’s obvious a lot of love went into the visuals to help recreate that creepy feeling that players got from wandering around in an unknown place in the original Yume Nikki, but ultimately it doesn’t feel like a lot of effort went into them. Animations tend to be overdrawn and janky. Simple actions like picking up items off the ground takes forever, and there are odd dynamic physics tied to Madotsuki’s skirt, causing it to swish around like a dead leaf stuck in a spinning bicycle spoke. Other actions, like a grate receding or a trapdoor opening, have zero effort invested in their animation, really breaking the immersive feeling the admittedly well-crafted scene around them has created. While the world of Dream Diary looks impressive at times, it doesn’t play as well. Worlds are ultimately too easy to get lost in, not because of a confusing layout, but because it’s hard to figure out what to do to progress in certain areas. The puzzles in Dream Diary fall prey to moon logic more often than not. While some tasks are intuitive and don’t require you to refer to a guide, the prominent type of puzzles in Dream Diary are ones that get solved through the sheer luck of trial-and-error instead of actual deduction. The killing blow for Dream Diary is the game-breaking bugs that were included at release. For example, there was a section where I fulfilled the requirements of a puzzle, saw the animation play, and then... nothing. No item, no progress, no more game. I couldn’t solve the bug by restarting, reloading, or even reinstalling. Other players also report encountering bugs such as locking cameras, being unable to move right while playing a mini-game, the height of a jump being tied to frame rate, and many others. This would be forgivable if Dream Diary were in Early Access, but as it stands, Dream Diary is past version 1.0 and is released on Steam as a complete game with an asking price of $19.99. By the time this review is published it’s possible these bugs might be fixed, especially because the developers have opened a bug reporting thread on the Steam page, but there’s no excuse for it having been released with so many holes. Dream Diary is an example of the “launch now, fix later” attitude that developers are adopting in an age where updates are frequent. Yes, the developers are working to correct the game-breaking bugs. Looking past that, Dream Diary has unintuitive puzzles, bad controls, and feels like it was rushed to release. It disclaims being a recreation, which is good because it fails to recreate the elements that cemented the original Yume Nikki in the hearts of fans, leaving that void unfilled. Fans of the original Yume Nikki might be disappointed that Dream Diary isn’t a faithful recreation, but as a reimagining it doesn’t have an obligation to perfectly recreate its source material. Unfortunately, the final product is an ultimately unsatisfying experience plagued with game-breaking bugs and confusing puzzles that can’t be redeemed with impressive visuals. This leads to disappointment for both fans and newcomers alike. Dream Diary is not worth the money, even if its price were cut in half.